What contains stocks, is traded like a stock, but isn’t a stock – yet could be the difference between making the market average and beating the average? And it’s an excellent way for investors to diversify their portfolio without having to research hundreds of stocks in different sectors or categories. Many beginning investors – and even more advanced traders – aren’t clear on the value of ETFs, however, and Cabot Wealth Network is here with a completely FREE guide to help those investors get into the game. That’s right: Cabot Wealth Network is giving away a guide to ETF investing, written by our leading stock advisor, that explains the concept and value of ETFs, along with delivering some of our favorite and most profitable ETFs. Exchange-traded funds, or ETFs, have many benefits for investors. As you’ll read in this guide, not only do they allow investors to easily diversify their portfolios, they also cost less than mutual funds because they have no managers. The guide explains how this works, and it also explains why there are a huge variety of specialized funds. In fact, there are more than 1,400 ETFs available today. Fortunately, this guide helps identify the best of these for you. Are you interested in the financial sector? You’ll want to consider XLF, or Financials Select Sector SPDR ETF. Is health care on your radar? The answer there is Health Care Select Sector SPDR ETF (XLV). And as you’ll discover, the beauty of this guide is that it also explains when to invest in different sectors, and why to consider an ETF instead of focusing on one or two stocks in that sector. One of those sectors right now is energy. With oil prices back near $50 a barrel and natural gas prices also trending upward, the entire energy sector is getting a much-needed boost. Instead of trying to pick and choose which oil and gas stocks are benefiting most from the energy rebound, you can gain access to entire segments of the energy sector by investing in three carefully chosen ETFs. ETFs: Portfolio diversity, affordable and simplified. 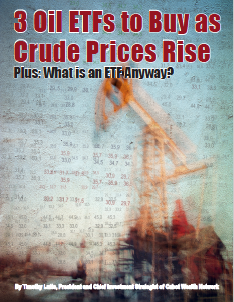 Get the secrets in this FREE Special Report, 3 Oil ETFs to Buy as Crude Prices Rise Plus: What is an ETF Anyway? That’s just one of many valuable tips included in this guide – advice you can quite literally take to the bank. You may be wondering why you should take advice on investing your hard-earned money from us here at Cabot Wealth Network. Let me just say that Cabot is unlike any other investing advisor you’ve ever used. We’re not just advisors, we’re personal contacts for our subscribers’ guidance and support, which means that our hard-won reputation is expressed in the expertise we’re sharing in this guide. Even though you’re not a subscriber right now, we value your opinion. At Cabot, we’re a family of both advisors and investors – many of whom are themselves second- and third-generation subscribers. In fact, we’re an actual family here: Our President and Chief Investment Strategist, Timothy Lutts, is the son of our company’s founder, another of our analysts is also a member of the family, and all of our other analysts are all long-term advisors with the company. Cabot Wealth Network even lives right where it was founded, in Salem, MA, where we’re firmly grounded in the New England work ethic. There are no anonymous stock pickers opining from a shiny skyscraper in Manhattan – just genuine, expert market analysts sharing that expertise to make you a wealthier person. In fact, this guide is actually written by Tim Lutts, who, as I mentioned, is our President and Chief Investment Strategist. Under his leadership, Cabot publishes 12 advisories to over 200,000 subscribers around the world. He is also the chief analyst for Cabot Stock of the Week and is a regular contributor to Cabot’s free email newsletter, Wall Street’s Best Daily. Under his leadership, Cabot advisories have been honored numerous times by Timer Digest, Hulbert Financial Digest, Dow Jones MarketWatch and Timer Digest as the top investment newsletters in the industry. He has also appeared on numerous podiums as an investing expert, including Bloomberg TV and the World Money Show, led Investor’s Business Daily discussion groups and been interviewed by Dow Jones MarketWatch, TopStockAnalysts.com, VoiceAmerica.com and numerous other business news organizations. As you can see, Tim is pretty busy, and it’s not every day that he has time to share his expertise, so you know 3 Oil ETFs to Buy is a pretty special guide. If you’re not already leveraging ETFs to diversify and protect your portfolio from risk, you’re leaving money on the table. What better way to get started expanding your investing horizons than with a FREE expert guide? So I urge you to download this guide right now. It will take only a half-hour or so of your time for the first read-through, and it will make an enormous difference in your investing approach – and the comfort of your golden years. You certainly have nothing to lose, and everything to gain. Download it now! PS: Remember, 3 Oil ETFs to Buy is absolutely FREE. You simply can’t make a better investment than that in your portfolio and your retirement. Download it now!